Personalize your Flying Circle bag or case with your initials, name, or any alphanumeric characters for just an additional $10 per item! Please allow 5-7 business days for your monogrammed order to process. To customize your bag or case, select the item you wish to order and locate the "Monogramming Options" section on the product page. 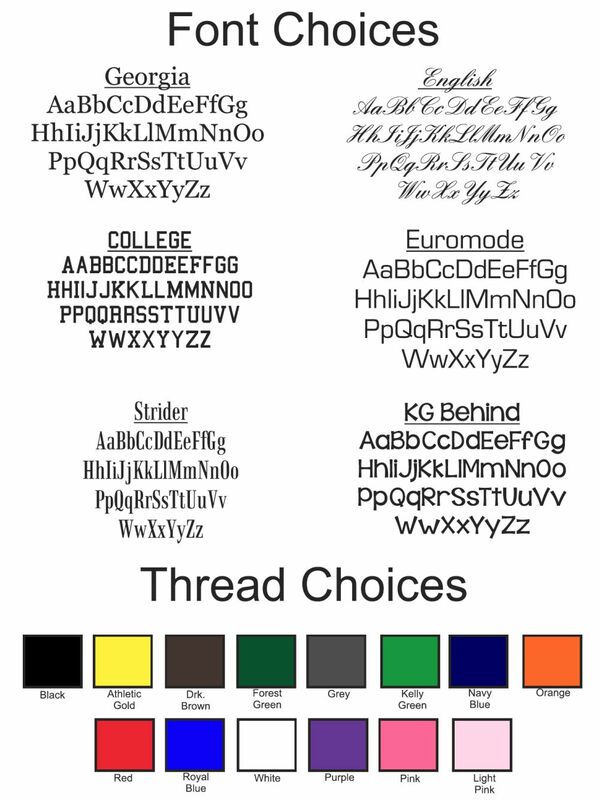 Select your font and thread color options, and enter the letters and/or numbers you would like on the item. Silkscreening and embroidery are available on retail orders with a minimum of 12 pieces. These options are not yet available in our online store, so please call 800-344-7242, ext. 141 or email sales@flyingcirclegear.com for a custom price quote. Silkscreening and embroidery are also available on wholesale orders with a minimum of 12 pieces. For more information please call 800-344-7242, ext. 141 or email wholesale@flyingcirclegear.com. Please allow 10-15 business days for processing custom silkscreen or embroidery orders once the artwork has been approved. Additional time may be required if the order quantity is large or it involves complicated artwork. To ensure that your order is processed as quickly as possible, it is important that our graphics department receives artwork in a standardized form. Please use the following guidelines when submitting customized artwork. Please submit your artwork via email to sales@flyingcirclegear.com. If you do not already have artwork, we will be happy to provide it for you at $25/hr. All artwork created by Flying Circle must be approved by the customer in writing prior to processing the order. Embedded fonts need to be sent as a separate file or need to be converted to curves. Minimum 300 DPI. Please specify PMS colors. We will do our best to match PMS colors, but it may not be possible to get an exact match. Artwork will be sized to best fit the available space on the bag.